Ed Pownall of Bodog.com talks about the odds heading into the Oscars. >>> with the super bowl only a few weeks ago, most gambling conversations involves nfl point presents, but betting on super sunday is old hat. there's only two teams to choose from. basically it's a coin flip. why not bet on something that has four, five, or even ten potential winners? that's right, we're talking the academy awards , and we're talking about betting it on it, which is perfectly legal across the pond. joining us from london is head political trainer from bodog.com. on best picture , you've got " social network " as the clear favorite when there's a lot of people pulling for " toy story ." what's with that? >> well, i think when you're betting on the academy awards , you have to remember who the academy themselves are made up of. a lot of actors. if you put something like toy story , they love roles where there's big acting, triumph overadversity, that kind of thing, so bear in mind not the nips you like yourself, but who picked the winners, and " social network " and "the king's speech" are the two best horse race in our book. 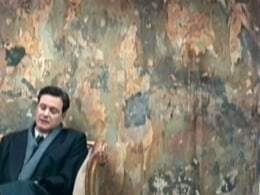 >> "the king's speech" is that a bit of bias, because they just won the golden globes and they're showing up well on the odds? >> definitely the golden globes are the blueprint for the oscars and increasingly becoming the footprint. but honestly it doesn't matter what price we offer colin firth , 1 to 8, 1 to 10, now it's 1 to 16. people are seeing this as buying money, free money . you have to bet $16 to bet one. people say colin first is the best bet of the year. >> people would think that jessie -- jesse eisenberg wasn't in there, that he as a young guy would have a real shot. how do you call that one? >> yeah, he's an outsider, and it's very unfortunate that he's come up against this. they do love this idea of acting, and the fact that "the king's speech" had problems getting produced at all is the whole triumph over yaz versity, and the academic is becoming very formulaic with who they give oscars to. i think that's why " social network " as a film is favored to win, but the actors themselves seem to be excluded from that. >> now, on best actress , everyone seems to think that natalie portman will be a shoo-in from the " black swan ." >> i think best film will be " social network ." i think colin firth is the bet of the year, i think natalie portman could be turned over, maybe seen as a bit too mainstream. i think here annette bening , an old favorite, she even wearing black media specs tess globes, they love that look. the film is very earnest and rites of passage . i think annette bening could be one of the very few upsets we see this year. >> now, since we're talking about betting, we have to talk about football and the super bowl . i'm a passionate new york jets fans. if we throw up the odds on the super bowl , you've got the jets as a real long shot, the green bay packers and pittsburgh steelers obviously in much better position. how come you won't go with my jets? >> well, they're not completely out -- 7-2, 3 1/2 to 1 essentially. that's pretty tight. there's been so many upsets on the way, i certainly wouldn't put you off backing them at all. the money is all for the packers, because they've been there -- my concern with your beloved jets is they look like they won their super bowl already, beating the patriots is a massive result, the biggest upset so far. that said the jets have gone there to pittsburgh before, done it, so the form book says that they can, and it's very, very tight on the spread, as we call it, where you're giving points away to each side. it's only plus/minus 3.5. if that was at home for new york, they would be favorite, so just going away is the only reason they're not favorites. of course, when they get to the final, i think they'll meet green bay , and that would be tricky. but 3.5 to 1 in a four- horse race , that's not an outsider by any stretch. >> and i'll be wearing my joe namath memorial jersey, so that could help. you have a very interesting bet on brett favre actually playing a regular season football game next year. let's put that up on the screen. it's 20:1. i'm amazed it's only 20:1 that brett favre will see action next year? what do your bettors know that we don't know? >> that's the better question to be honest. we started at 33:1, and then packed backed it into 25:1, and now 20:1. the huge question here is is that just heart and loyalty, or is it reality? and i have a feel this could be sentimental betting, which from a bookmaker's point of view is just easy money . >> you never want to let sentiment get in the way of a hard-headed trade. ed, we thank you at always for your perspective. it's great you can make a line on all this stuff. we'll talk to you again, i'm sure.